The first hole at Augusta National Golf Club begins right next to the clubhouse. The drive is uphill and there's a slight doghill to the right. Trees on the left will catch drives that stray too far. The approach is to an undulating green. When Augusta National first opened, this was the 10th hole. The nines were flipped in 1935, making Tea Olive the No. 1 hole. Tea olive (scientific name osmanthus fragrans) is an evegreen shrub that can be shaped into a small tree. As the scientific name makes clear, its small white flowers, which bloom from December through March, are highly fragrant. Through the 2018 Masters, the No. 1 hole has played to an all-time average of 4.24 strokes. That ranks it as the sixth-toughest hole on the course during tournament play. 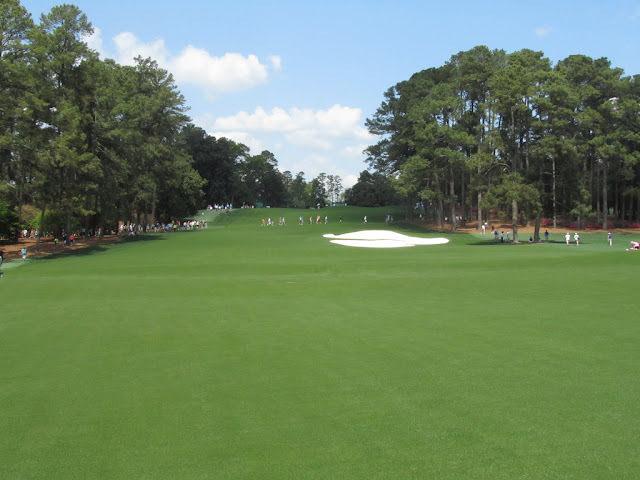 The easiest the first hole has ever played for a single tournament is 4.0082 strokes during the 1974 Masters. The highest stroke average it's had is 4.47 during the 2007 Masters. Highest score ever on No. 1: The worst score ever on the first hole is 9, a quintuple bogey, and it's happened only once. Ernie Els is the golfer who did it, during the 2016 Masters.